On January 17, the Bulletin of Atomic Scientists moved their famed "Doomsday Clock" to five minutes to midnight to reflect "worsening nuclear and climate threats" that make this the "most perilous period since Hiroshima." According to the Bulletin, "The major new step reflects growing concerns about a 'Second Nuclear Age' marked by grave threats, including: nuclear ambitions in Iran and North Korea, unsecured nuclear materials in Russia and elsewhere, the continuing 'launch-ready' status of 2,000 of the 25,000 nuclear weapons held by the U.S. and Russia, escalating terrorism, and new pressure from climate change for expanded civilian nuclear power that could increase proliferation risks." The Bulletin of the Atomic Scientists was formed in 1945 as an emergency action undertaken by atomic scientists who saw urgent need for an immediate educational program about atomic weapons. One of its purposes was to educate fellow scientists about the relationship between their world of science and the world of national and international politics. A second was to help the American people understand what nuclear energy and its possible applications to war meant. The Bulletin contributors believed the atom bomb would only be the first of many dangerous presents from “Pandora’s box of modern science.” Over the years, contributors have included many nuclear scientists such as Albert Einstein and Robert Oppenheimer, as well as thinkers such as Bertrand Russell. See wikipedia post here. A streaming audio replay of today's news event will be available on the Web here at 6pm EST. The Bulletin will be holding a roundtable on nuclear power and climate change on February 18. 1) Major studies (MIT, Commission on Energy Policy, International Atomic Energy Agency) agree that about 1,500-2,000 new large reactors would have to be built for nuclear to make a large dent in greenhouse emissions. Operation of that many new reactors (there are 440 worldwide today) would cause uranium reserves to run out in just a few decades and lead to mining of lower grade uranium, which itself would lead to higher greenhouse emissions. 2) Construction of 1,500 new reactors would cost trillions of dollars, taking needed resources from clean and safe responses to global warming through energy efficiency and renewables such as wind and solar. 3) Construction of 1,500 new reactors means opening a new reactor once every two weeks for the next 60 years. Since it takes 6-10 years for a reactor to be build, and the world's nuclear reactor manufactures can only build about half that amount, we are already far behind that schedule. We can't wait that long to solve the climate crises. 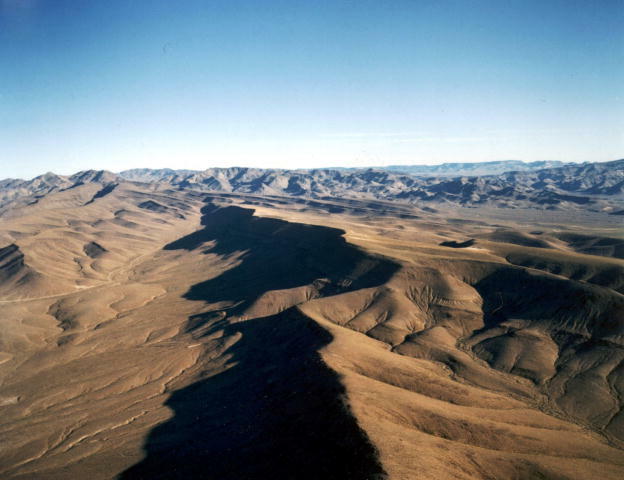 4) Operation of 1,500 new reactors would require the need for a new Yucca Mt. sized radioactive waste dump somewhere in the world every 3-4 years. The scientific and political obstacles to achieving such a feat are insurmountable. 5) Odds of a major nuclear accident are approximately 1 in 10,000 reactor-years. Operation of 1,500 new reactors (plus 440 existing) would result in a Chernobyl scale accident as frequently as once every five years. 6) 1,500 new plants would require dozens or more new uranium enrichment plants, creating thousands of tons of plutonium and posing untenable nuclear proliferation threats. 7) Although the nuclear industry claims that nuclear electricity is carbon free, this does not take into account the entire nuclear fuel chain. Significant greenhouse gas emissions are emitted in uranium mining, milling, processing, enrichment, fuel fabrication and waste storage. Nuclear fuel chain greenhouse gas emissions approach those of natural gas, and are far highter than from renewable energy sources. 8) Nuclear power does not work in warming climates. See my post here. 9) By 2050, the world will need about 25-30 Terrawatts of energy, or the equivalent of 25-30,00 nuclear reactors. It is not possible or affordable to build that many reactors, but it is possible to build that much capacity through energy efficiency improvements, and through sustainable energy sources such as solar, wind, biomass, and geothermal. We can choose nuclear power, or we can address global warming, but we can't do both. PARIS, Jul 27 (IPS) - The extreme hot summer in Europe is restricting nuclear energy generation and showing up the limits of nuclear power, leading environmental activists and scientists say. The heat wave since mid-June has led authorities in France, Germany, Spain and elsewhere in Europe to override their own environmental norms on the maximum temperature of water drained from the plants' cooling systems. The French government announced Jul. 24 that nuclear power plants situated along rivers will be allowed to drain hot water into rivers at higher temperature. The measure is intended "to guarantee the provision of electricity for the country," according to an official note. France has 58 nuclear power plants, which produce almost 80 percent of electricity generated in the country. Of these, 37 are situated near rivers, and use them as outlet for water from their cooling systems. The drought accompanying the hot summer has reduced the volume of water in the rivers, and might force some power plants to shut down. Under normal circumstances, environment rules limit the maximum temperature for waste water in order to protect river flora and fauna. "For many years now, French authorities have defended nuclear power arguing that it is clean energy, good for the environment, and that it will help combat global warming, for it does not emit greenhouse gases," Stephane Lhomme, coordinator of the environmental network Sortir du Nucléaire (Phase Out Nuclear Power) told IPS. "Now, with global warming leading to extreme hot summers, we are witnessing that it is the other way round," Lhomme said. "Global warming is showing the limits of nuclear power plants, and nuclear power is destroying our environment." During the hot summer of 2003, French authorities had allowed nuclear power plants to drain excessively hot water into rivers, leading to considerable damage to flora and fauna, Lhomme said. According to the minutes of the National Surveillance Committee on water drained from reactors Aug. 21 and Sep. 3 2003, "hot water temperatures might have led to high concentrations of ammoniac, which is potentially toxic for the rivers' fauna." The minutes point to a European norm on the concentration of ammoniac in rivers, which France did not respect. Meanwhile France is importing some 2000 megawatts of power per day from neighbouring countries to compensate for shortages in production at nuclear power plants. While the French authorities have overridden their own environmental norms, in Germany energy providers have slowed down some nuclear reactors to limit waste water temperature and to protect flora and fauna. Reactors Kruemmel, Brunsbuettel and Brokdorf situated along the river Elbe which flows through Eastern and Northern Germany have all been slowed down. So have traditional fossil fuel power plants situated along the river Rhine. The nuclear reactors Isar 1 near Munich, and Neckarwestheim near Stuttgart have being authorised to drain hotter water into the nearby rivers than normally allowed. In Spain, the nuclear power plant at Santa Maria de Garoña, one of eight Spanish reactors, was shut down last weekend due to the high temperatures recorded in the river Ebro, into which the reactor drains the water used in its cooling system. The power plant, Spain's oldest, provides 20 percent of the electricity generated in the country. German energy expert Hermann Scheer says the situation shows a need for radical change in policy. "We must massively invest in renewable energy sources, and get rid of nuclear power as soon as possible," he told IPS. Scheer is president of Eurosolar, the European association for renewable energy resources, and winner of the 'Alternative Nobel prize' for his commitment to the environment. In France, nuclear scientist Hubert Reeves urged the government to "invest massively" in renewable energy resources. "We are behind many of our European partners such as Germany, Denmark and Spain in this matter, and cannot wait until the energy crisis reaches its climax to find an alternative to our present model," he told IPS. A National Academy of Sciences Report released yesterday indicated that there are no insurmountable technological obstacles to closing the Indian Point nuclear reactors in Westchester County, New York, although there are difficult political, regulatory, financial and institutional issues that have to be overcome to compensate for the loss of Indian Point's 2,000 megawatts of power. Congresswoman Nita Lowey found the report very encouraging. She stated, "To me, the bottom line is, where there's a will there's a way [to close the plant]." Lowey said that the report shows that Indian Point is not necessary for meeting future power needs, despite estimations of a growing need for electricity. "A combination of strategies can replace the power produced by the plants and meet the state's growing need for electricity." As the report points out, one of the best ways to save energy is through energy efficiency measures. Even the U.S. Secretary of Energy Samuel Bodman last year indicated that U.S. homes waste about 30% of their energy because of things such as inefficient lighting and appliances, and poor insulation. The two Indian Point plants will close unless they are relicensed by 2013 and 2015, which provides plenty of time to overcome the political, financial, regulatory and institutional issues. Interestingly, the headline writers for the two major regional papers spun the report very differently. The headline in the June 7 Journal News, the local Gannett paper, stated: "Scientists Say Indian Point Power Replaceable." By contrast, The New York Times, in its morning June 7 newspaper stated: "U.S. Science Panel Sees Big Problems if Indian Point Reactors Are Closed." But even The Times seemed to waffle, since an earlier headline in the June 6 web edition stated: "N.Y. Grid Could Stand to Lose Reactors, Panel Says." The National Academy of Sciences report is available for download. Its headline reads "Replacing Indian Point Nuclear Energy Feasible." After September 11, I became active in the efforts to close the two Indian Point nuclear reactors in Westchester County, NY. Having seen the impossible two blocks from my office in lower Manhattan, I imagined the unthinkable at the plant, near my home, just 40 miles from Ground Zero in the most densely populated region of the country (20 million people within 50-mile radius of the plant). Others were paranoid too, realistic even. The Indian Point Safe Energy Coalition (IPSEC), a coalition of more than 70 groups, formed to close the plant and promote safe and renewable energy. In his State of the Union address in January 2002, President Bush said that diagrams of U.S. nuclear plants had been found with terrorists in Afganistan. 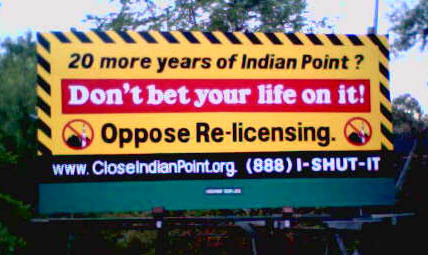 IPSEC rallied support from citizens and officials in the Hudson Valley, NYC, Connecticut, and New Jersey; 52 municipalities, 13 community boards, and over 400 public officials (including 11 members of Congress), have called for the closure of Indian Point. A report commissioned by NY State in 2002 and conducted by former FEMA head James Lee Witt and Associates concluded that the Evacution Plan's "system and capabilities . . .are not adequate to . . .protect the people from an unacceptable dose of radiation in the event of a release from Indian Point." Hardly a suprise to anyone who's tried to escape from Westchester during rush hour, even without a radiation release. 7) Claimed the plant was "safe" even though it has been plagued with safety issues since it went online in the 70's, and it currently has radioactive leaks from unknown sources. Hmmm, apparently someone from an Entergy Corporation office in Arkansas (their headquaters are there) had used my name as search parameters from the "Alltheweb.com" search engine. I also had sent my post about the Greenburgh Energy Fair as a letter to the editor to the Journal News, the local Gannett paper that has devoted a large amount of coverage, editorials, and letters on Indian Point over the years. I was told that on Thursday my letter would run, and so it did. The Journal News posts letters on line, and when I found mine, in small print on the left part of the screen, I smiled. But then I saw it, the large lumbering animated gif to right (you can see it to the right and above, on this page right now) drawing it's attention away from my words, just telling me, assuring me, italically insisting how safe I feel (if you visit the site, you may have to "refresh" a few times to see it, the ads alternate). Coincidence? Well, I don't think Entergy targeted my specific letter to the editor, but they know that the letters to the editor section has had dozens, maybe hundreds, of letters from people who want the plant closed. Clearly Entergy is placing their ads in places that might negate the sentiment of the writers. So how about it, now that you know more, do you feel safer? Or is really time to renew the xanax prescription? IPSEC is gathering forces to stop Entergy’s anticipated bid to re-license Indian Point for an additional 20 years. To contribute, write letters, or join the efforts, go here.